Finding the perfect dress is the most important thing to any newly engaged bride which makes your designer very important indeed. Step forward Caroline Castigliano. HOW WOULD YOU SAY THAT BRIDAL GOWNS (AND WHAT BRIDE’S WANT FROM THEIR DRESS) HAS CHANGED OVER THE 27 YEARS YOU HAVE BEEN IN BUSINESS? In 1991 weddings were still mainly religious and the ceremony was at a place of worship, some weddings took place at a registry office but this was very different from weddings of today. Now civil weddings can take place anywhere, a castle, a vineyard, the beach – you name it and you can properly be married there! So I would say there is a change in the expectation of the bride, but not in her desire for perfection or for the day to be the most special and important of her life. But she has freedom now to express herself more openly, to wear a gown that is more risqué – to really live the dream. AND WHAT ELEMENTS HAVE REMAINED CONSTANT? I am well known for clean cut lines, and this has stayed constant over the years. I draw on fashion to create highlights within a design that is mainly classic, and most importantly the cut and structure that I have stayed true to since the beginning. PEOPLE ALWAYS SAY THEY CAN SPOT A CAROLINE CASTIGLIANO, BUT HOW WOULD YOU DEFINE THE CASTIGLIANO ‘SIGNATURE’? The Castigliano signature style is understated effortless glamour – beautifully engineered gowns in luxury fabrics. HOW IMPORTANT IS DESIGNED AND MADE IN THE UK TO YOUR CLIENTS, AND TO YOU? I think brides like to know that under the umbrella of MADE IN BRITAIN that time and precision has gone into the detail and the quality of their gown/dress. It is also impossible to create bespoke gowns within a factory environment or Made to Measure – these need hands on skilled technicians to create quality gowns. So many designers have now taken their manufacturing abroad to gain more margin in their business- they immediately loose the quality and attention to detail as their clothes are made in large factories – slowly over time they cut corners and the product changes and they just have another standard dress. THERE ARE SO MANY STYLES OF WEDDING DRESSES TO CHOOSE FROM THE SEARCH CAN FEEL A LITTLE OVERWHELMING. INITIALLY, WHAT SHOULD BRIDES-TO-BE THINK ABOUT WHEN SETTING OUT ON THEIR DRESS SEARCH? Once they have booked the venue, and they have seen the room where they are going to have their wedding breakfast, they have seen the dance floor, they just want to think about that moment. When you leave the table and walk towards the dance floor with their now husband how is it that they want everyone to see them. You don’t need to know the shape of the dress, if you are working with an expert they will find the silhouette for you. What you need to know is what that dress is saying to people is it saying a very strong traditional look, soft and romantic, elegant and classic, vintage, boho. What is the appeal of the dress? 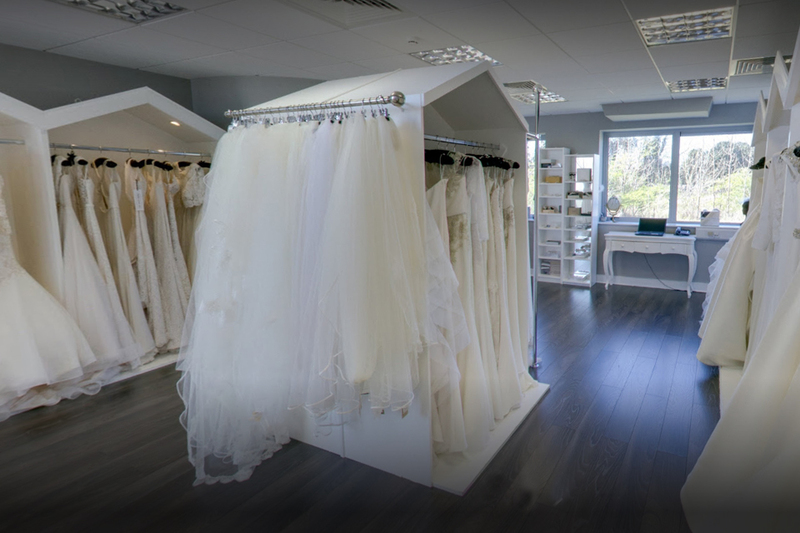 Without considering the silhouette decide on the vision – once this has been determined – go see one of our fantastic stockists and you will get advice. It is important to work with someone that understands silhouettes and fabrics so they can show you what suits you what creates a strong silhouette for you. If you are 5ft you will suit totally different silhouettes to someone that is 5’8” tall – if you are full busted you will suit different silhouettes to a bride that is more petite. Once you get going it is all quite easy but it starts with that one all important question – What vision do I want my future husband and my guests to see when I arrive at the wedding. IN WHAT WAYS CAN PROFESSIONAL BOUTIQUE STYLISTS AND DESIGNERS HELP BRIDES MAKE THE MOST OF THEIR FIGURE – HIGHLIGHT ASSETS AND DISGUISE ANY BODY HANG-UPS? When choosing a wedding gown, it’s important to find a silhouette that properly accentuates your figure. The cut and fabrics of your gown are essential for the beauty of your dress. Fit is everything, a gown has to fit amazingly, it has to balance a person’s figure, bring out all the fantastic elements and play down the things they don’t like so much. They should look in the mirror and feel that they have never ever looked so beautiful; that they look the most beautiful they ever have in their life – that is the absolute key. The art of designing brilliantly is when you can have someone who comes in who is 5 ft tall with a very full bust and she looks incredible in a dress and you can also take a dress on a girl who is 5’9 with a very small bust and make her look absolutely incredible. Design is about being able to take all the different body shapes and make them look stunning. HOW DO YOUR DRESSES HELP TO ENHANCE THE FEMALE FIGURE WHILE REMAINING COMFORTABLE? Corsets are the engineering of our gowns, they are the foundation that everything is built around- each panel is hand cut to mould and sculpt the figure. They also have a very flattering effect on the brides figure, I design the corsets to really balance the figure and extenuate a small waist. I have a number of different corsets that create different effects depending on the design of the gown, nothing will ever compare to a beautifully structured corset creating the foundation of the gown. We have also developed a unique stretch corset that is to die for so while you are getting the beautiful balance you also get great comfort. WHAT OTHER ELEMENTS OF THEIR ATTIRE CAN HELP TO IMPROVE A BRIDE’S POSTURE, STANCE AND CONFIDENCE – ANY GOLDEN TIPS WHEN SHOPPING FOR SUCH E.G. UNDERWEAR, SHOES ETC. I like to create a corset in as many of my gowns as possible as it really helps a bride with her posture. Even if you are slim with a perfectly balanced figure corsetry helps in every way as it makes you stand up straight and walk nicely with a straight back. It also effects the way she sits so ultimately has a sensational effect on all the photographs and videos taken on the big day.